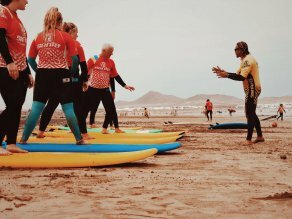 Surf Lessons 1 day in Lanzarote usually lessons are in Famara beach, Lanzarote. Although weather conditions and level of the students can be taught in another zone of the island. This course is suitable for both children and adults, and suitable for all levels, from beginner to advanced students. This course includes all you need for the lessons; Neoprene Surfboard. Monitor specialized in teaching surf, lifesaving and water rescue. Liability insurance and ACCIDENTS. Beach picnic, sandwich, fruit, energy drink or juice and water. All groups are small. We offer the ability to pick up students at the hotel or accommodation. All courses with minors must be signed by the parent or legal guardian. ¿How many days you want? Minimum service for two people. Only the service is provided in Arrecife, Costa Teguise, Puerto del Carmen and areas near Famara.